SharePoint Management Tool! Free Download. Try Now. Every SharePoint administrator's nightmarish challenge is to streamline user access to critical resources. User access issues arise from inadequate permissions and inefficient group management. Further, managing permissions and security groups is vital for security auditing and compliance, as they define each user's access to critical resources. This means that you need an effective way to manage permissions and groups. Managing permissions and groups is not as easy as it sounds. So, you need a solution that not only provides reports for complete visibility into permissions and groups, but also offers a central console to manage them effectively. SharePoint Manager Plus is that comprehensive solution. It empowers you to easily manage permissions and groups from a central console, in addition to having out-of-the-box reports that provide clear visibility of your SharePoint infrastructure. Unified console: Perform targeted or bulk user permission and group changes for your SharePoint server, Office 365 configuration, or hybrid environment. You can also create and manage SharePoint groups and permissions for multiple site collections all at once. Site collection audit settings: Configure site auditing settings for multiple SharePoint environments. Clear visibility: Gain insight into broken and unique permissions. You can also resolve overwhelming access denial issues with the Check Permissions report, which lists all users' permissions, thus facilitating quick cross verification and speeding up the access granting or denial process. No laborious tasks: Easily copy permissions and group memberships from one user to another, saving time and therefore increasing operational efficiency. Easy delegation and monitoring: Effectively delegate group and permission management to corresponding site collection owners by assigning them a technician role in SharePoint Manager Plus. You can also monitor the activities or management tasks performed by these technicians to ensure the delegation is effectively carried out. 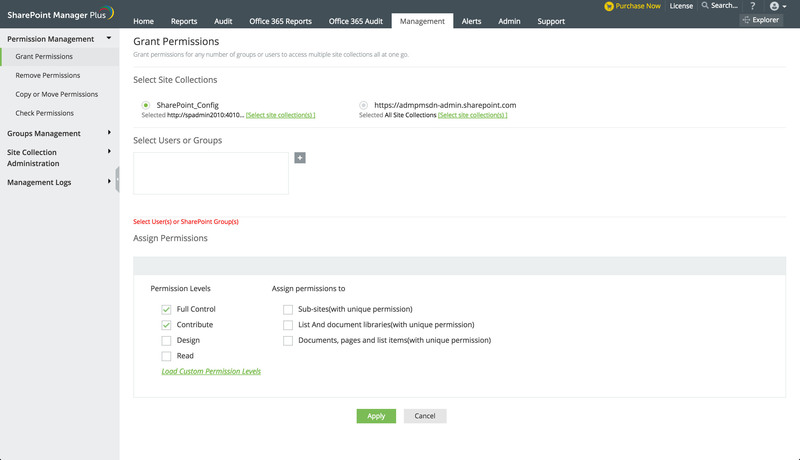 SharePoint Manager Plus makes permission management simpler by letting you add, remove, or copy permissions for targeted or bulk site collections in a single click. It provides additional options such as applying permissions to sub-sites and site collections, as well as letting you check user permissions for site collections.